I finally got time last Sunday to brave the cold and take pictures of a few projects. 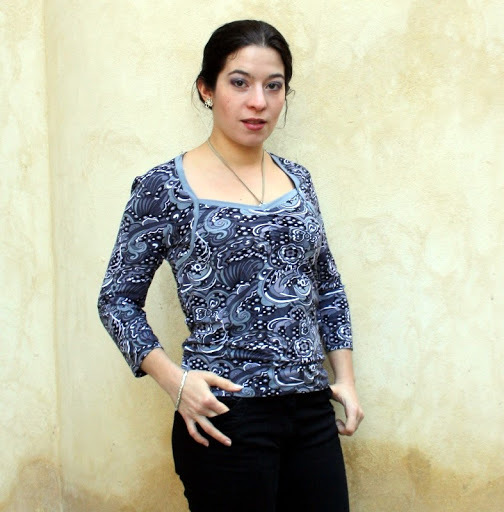 First up is a three-quarter-sleeved Jalie sweetheart top. I was also a little freaked out by the tiny seam allowances the first time I made this top, which played a role in my cutting the top slightly bigger. I know the SAs match those on a serger, but I don’t like sewing my knits directly on the serger: I always fear the seam won’t be sturdy enough (especially for this kind of top, which is bound to get a lot of use and get washed often); so I first sew on the sewing machine, then use the serger, both for added security and of course for a neat seam finish. I believe this Jalie pattern is meant to be worn close-fitting, to bring out the details of the yoke and neckline. That being said, this top still looks wearable to me, and the loose fit gives a more relaxed look; I figured it was good to have a more loose-fitting t-shirt in my wardrobe, which I why I didn’t take it in. I love the colourway. Grey-blue and teal – totally my colours. I used remnants from the first top to make contrasting bands. It’s a good thing I have such an obsession for blues/teals or purples: it means there’s a lot of matching potential in my fabric stash (and it’s fun coordinating my outfits everyday!). Et puis je n’avais pas trop aimé les marges de couture très étroites de ce patron ; c’est pour ça aussi que j’ai coupé plus grand. Ces marges correspondent à celles d’une surjeteuse, mais il est très rare que je couse directement à la surjeteuse. J’ai toujours peur que les coutures ne soient pas assez solides (surtout pour ce genre de haut qui se porte et se lave beaucoup), alors je fais d’abord les coutures à la machine, puis je surjette, pour une couture plus solide et bien sûr pour une jolie finition. Il faisait vraiment froid, surtout avec le vent : j’essayais de m’empêcher de claquer des dents ! LOL. Il n’y a pas assez de lumière en ce moment pour prendre des photos nettes en intérieur, et je n’aime pas l’éclairage artificiel, alors je préfère les prendre dehors. Bon, même s’il est un peu grand, il me plaît ce haut, et puis ça donne un style plus relax ; je me dis que c’est bien d’avoir ce genre de haut dans ma garde-robe, et c’est pour ça que je ne l’ai pas repris. J’adore les couleurs de l’imprimé… Bleu-gris et ardoise : c’est vraiment mes couleurs ! J’ai utilisé des restes du tissu du premier haut pour faire des bandes contrastantes. C’est ça qui est chouette dans ma lubie pour les mêmes couleurs (bleus/turquoise ou violet) : il y a souvent des possibilités pour assortir les tissus… Et au quotidien, je m’amuse bien à assortir mes tenues aussi. Bonnes fêtes de fin d'année à toi. Beautiful, Isabelle! I think I prefer it with the longer sleeves and I love the contrast detail, it's very elegant! I think it's a really cute top and it looks great on you! 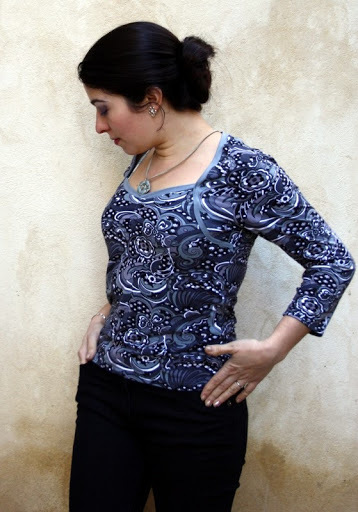 I love your Jalie top – this style is very nice, I think I may have to try this pattern. It looks beautiful on you and the colours are very lovely. Both the colours as well as the shape and fit look great on you! The more relaxed fit is a nice change, and makes this even more interesting! Don't worry at all about the serger seams! Because they stretch, they're actually a lot tougher than anything you could sew on the regular machine (in knits). Nice top, but I'm sure if we could enlarge more we could see your lips match the print's blue :-). Don't catch pneumonia with these pictures, it's not worth it..
Beautiful top – I love the colors! Very pretty print, I can see why the colors were attractive to you. That, and you look beautiful in blue with your lovely skin and dark hair. I didn't like those tiny seam allowances for Jalie at first, either. I cut larger seam allowances until I became comfortable with the smaller ones. I do sew the seams on the serger – I use a 4 thread serge. I found out with my daughter's clothes that a 3 thread serge wasn't strong enough, but that with 4 threads it was strong enough to hold. If her knit tops can survive what she does to them, then I know the seams are strong. Beautiful new top, those colors are your colors for sure, they are very flattering. Love the colors in this one. It doesn't look overly large, just a bit of a relaxed fit. I love the colors of this. I think this is a style of neckline that I would like to try. Of course the “maker of the Winter coat” is quite talented too! Please e-mail me your address so I can send you a Christmas card. Une francophone de plus et blogueuse bilingue de surcroit. Je vote pour! Merci beaucoup pour l' effort que je connais bien!